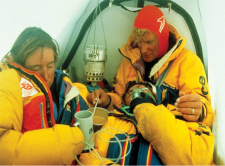 Jim’s newest presentation, High Altitude Mindset, is an engaging interactive event, combining compelling stories from his high altitude climbing experiences with interaction, reflection and dialogue. Jim recognizes that the world of business is increasingly a world of surprise and uncertainty, a world that confronts business leaders with disruptive change, where the ground shifts unexpectedly under their feet and the need to respond with clarity and commitment is greater than ever. In addition to the traditional management / leadership skill set, we believe that organizations are going to require a new set of skills that will allow them to operate at top efficiency in the kill zone of business volatility. Jim has uncovered in his own experiences a set of touchstones that allow him to reconnect to his most deeply held values and hard-won strengths in the face of extreme adversity. Participants are invited to reflect on touchstones in their own lives that can support them in tough times, offering practical tools for doing their part on their high-performing teams. without increasing their risk. Managing risk is not minimizing or avoiding risk. Time Commitment: option of half to full day based on specific objectives.